On Cape Cod there is a bay that faces directly into the setting sun during the summer months. When the tide is low one can count up to seventeen sandbars before seeing the water’s edge more than half of a mile off shore. It’s a mind-bogglingly seductive scene. As the sun sets, the water trapped in between the long thin bars begin to shimmer, glow and turn hot orange, red and magenta, ringed with opalescent greens and blues. The sand bars go from reddish dirty blond to deep eggplant. The shore is lined with a cast of locals and tourists, many sitting on the dunes or posing for snapshots. When the last bit of the sun dips below the horizon, a din of clapping and whoo-hooing is heard followed shortly by the irregular hum of engines starting up to take the spectators home. But for Graham Nickson, this is the time when the colors are the most intense. He knows to stay and look. He knows also the challenge of such a moment and of such a theme. 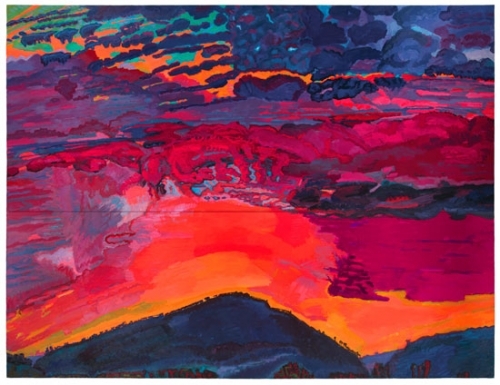 In the aptly titled exhibition, Paths of the Sun, Nickson demonstrates his capture of the transitory in a forty-year sampling of over 40 bedazzling paintings and watercolors of sunrise and sunset. There are examples of the small paintings in hand painted frames from 1972-74 made during time spent in Rome, when he initially adopted this time-worn theme and aimed at making a fresh interpretation of it. These small format works articulate a certain conception of light and a synthesis of abstraction and figuration that resulted in images that Nickson to this day continues to explore. The gemlike quality of these small-format works is emphasized by the wide, flat, profiled frames, which also underscore the individuality of each image. They link, in my mind, to the experience of finding small treasures in dimly lit churches. A group of watercolors, installed in a grid, conveys Nickson’s idea of painting the same tree as a foil to sunrises and sunsets. These are characterized by large, interlocking areas of brightly colored wash with hatched lines that become, bush, tree, branch and so on. They represent some of Nickson’s most extra sensory visions of the forces of nature upon his subject. Each is an animated world of its own, recalling the watercolors of Charles Burchfield and the newest large-scale paintings of Per Kirkeby, to be seen a few blocks away at Michael Werner Gallery. A second group of figureless watercolor landscapes of sunrise or sunset mesmerize with pulsating orbs and bands of rich color. But three monumental paintings anchor and at the same time steal the show. They make me want for more, not because they are deficient in any way, but becuase they are so full of so much that is absent in a great deal of painting today. A deep pleasure in viewing Nickson’s work is being able to discern the direct, straightforward use of the medium. To see the hand at work, to feel the effect of the choice of the oversized canvas, to be brought along as a viewer as if participating in the spectacle of this work: these are seldom achieved by anyone in today’s climate of immersive, overwhelming spectacle. The theatricality of sharp contrasting colors of red, orange, pink, deep blue, gray and violet in Traveler; Red Sky(2002), as well as in Red Lightening (2008-10) creates powerful epic images. Although these paintings produced a lingering emotional reaction, the most recent of the three, Tree of Birds (2009-11), is the most challenging for its seemingly effortless combination and arrangement of both representational and abstract elements. The scene, a tree of birds before a massive volcano within a mountain chain, is painted in shades of blue, grey, and violet, off-set by areas of light yellows and greens. A patchwork of interlocking clouds fill the sky, drop in front of mountains and cast shadow shapes upon fields below. There is a funky-chunkiness to these slightly comic, awkward forms as well as a remarkable compression between the foreground, middle ground and background. Shapes belonging to the background are pulled to the front of the picture plane and vice versa. Clusters of pale color are geometrically deployed in subtle triangulation that interestingly brings emphasis to the volcano peak. Here, we find a small, white shape, just like the pale lavender one to its right, which, surprisingly, is a bird in flight and not a cloud. One can imagine being in this scene and yet the painting conveys the immensity and mystery that we know of and experience but can never fully capture.